Homo sapiens idaltu (Afar: Idaltu; "elder" or "first born"), also called Herto Man, is the name given to a number of early modern human fossils found in 1997 in Herto Bouri, Ethiopia. They date to around 160,000 years ago. Paleoanthropologists determined that the skeletal finds belong to an extinct subspecies of Homo sapiens who lived in Pleistocene Africa. In the narrow definition of H. sapiens, the subspecies H. s. idaltu falls under the umbrella of Anatomically modern humans. The recognition of H. s. idaltu as a valid subspecies of the anatomically modern human lineage would justify the description of contemporary humans with the subspecies name H. s. sapiens. Because of their early dating and unique physical characteristics, they represent the immediate ancestors of anatomically modern humans, as suggested by the Out-of-Africa theory. 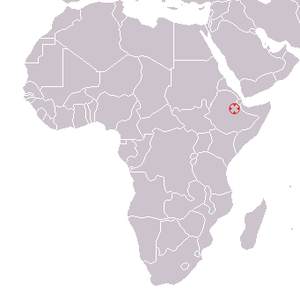 The fossilized remains of Homo sapiens idaltu were discovered at Herto Bouri near the Middle Awash site of Ethiopia's Afar Triangle in 1997 by Tim White, Giday WoldeGabriel and Berhane Asfaw, but were first unveiled in 2003. Herto Bouri is a region of Ethiopia under volcanic layers. According to radioisotope dating, the layers are between 154,000 and 160,000 years old. Three well preserved crania are accounted for, the best preserved being from an adult male (BOU-VP-16/1) having a brain capacity of 1,450 cm3 (88 cu in). The other crania include another partial adult male and a six-year-old child. The Omo fossils differ from those of chronologically later forms of early Homo sapiens, their morphology has features that show resemblances to African fossils, such as huge and robust skulls, yet have a globular shape of the brain-case and the facial features typical of H. sapiens. Anthropologist Chris Stringer argued in a 2003 article in the journal Nature that "the skulls might not be distinctive enough to warrant a new subspecies name". These specimens represent the direct ancestors of modern Homo sapiens sapiens which, according to the "recent African origin (RAO)" or "out of Africa" model, developed shortly after this period (Khoisan mitochondrial divergence dated not later than 110,000 BCE) in Eastern Africa. "The many morphological features shared by the Herto crania and AMHS, to the exclusion of penecontemporaneous Neanderthals, provide additional fossil data excluding Neanderthals from a significant contribution to the ancestry of modern humans." A 2005 potassium-argon dating of volcanic tuff associated with the Omo remains showed them to date from around 195,000 years ago. At the time of the dating, this made these fossils the earliest known remains of anatomically modern humans, older than the idaltu specimens. In 2013, comparative craniometric analysis of the Herto Homo idaltu skull with ancient and recent crania from other parts of Africa found that the specimen was morphologically closest to the Pleistocene Rabat fossil and Early Holocene Kef Oum Touiza skeleton. A later study found that Herto man and his contemporaries were cranially similar to Oceanians, with Northern Melenesians being the closest. ^ "160,000-year-old fossilized skulls uncovered in Ethiopia are oldest anatomically modern humans". UC Berkeley. June 11, 2003. Retrieved June 7, 2016. ^ White, TD; Asfaw, B; DeGusta, D; et al. (June 2003). "Pleistocene Homo sapiens from Middle Awash, Ethiopia". Nature. 423 (6941): 742–7. Bibcode:2003Natur.423..742W. doi:10.1038/nature01669. PMID 12802332. ^ "HOMO SAPIENS IDALTU". Bradshaw foundation. Retrieved June 7, 2016. ^ Stringer, Chris (June 12, 2003). "Human evolution: Out of Ethiopia". Nature. 423 (6941): 693–695. Bibcode:2003Natur.423..692S. doi:10.1038/423692a. PMID 12802315. ^ "Herto skulls (Homo sapiens idaltu)". talkorigins org. Retrieved June 7, 2016. Wikimedia Commons has media related to Homo sapiens idaltu.